However, a new smartphone was briefly teased at the end of the company's presentation at the Barcelona event. 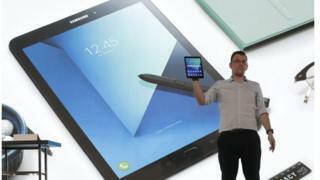 Samsung said the new device would be unveiled on 29 March in New York. "Not having [the successor to the S7] there will be a particular boon to Huawei," noted tech analyst Tim Coulling at Canalys, referring to Samsung's Chinese rival. "But it's known something is coming out, so the Samsung fans will probably be willing to wait." The hiatus follows trouble for the South Korean tech giant after its Galaxy Note 7 phone had to recalled twice, the second time permanently. Faulty batteries in the devices led some to catch fire. Campaign group Greenpeace made an unexpected appearance at the presentation. A protestor took to the stage with a banner saying "reduce, reuse, recycle" - apparently referring to the millions of Note 7 handsets that had to be withdrawn. More protestors rolled out another banner on the side of the building where the press conference was taking place. Of the new tablets, the Galaxy Tab S3 is the smaller of the two and comes with a 9.7in (24.6cm) screen. It is targeted at consumers who want to prioritise gaming and video playback. The larger Galaxy Book comes in two sizes: 10.6in and 12in. Samsung said it was suited to "on-the-go professionals". It comes with a snap-on keyboard and S-Pen stylus. The S3 runs Android 7.0 Nougat while the Book's operating system is Windows 10. "Like most of its competitors, Samsung has seen its tablet sales erode in recent years, as larger smartphones have pushed into tablet territory," noted Rhoda Alexander at analysts IHS Technology. But she added that the organic light-emitting diode (OLED) displays and powerful specifications of the new tablets should help differentiate the products from competitors. Samsung also launched a Gear VR headset and remote control. As with previous generations, the headset is a tie-up with Facebook's Oculus division. The remote is designed for one-handed control. It features a touchpad that lets users select options within virtual reality apps, and motion sensors to detect hand movements. In the past, owners had to use controls built into the headset or buy a third-party gamepad. That compared unfavourably with Google's rival Daydream View headset, which featured a motion-sensing controller of its own. The new Gear VR is compatible with the recent Galaxy S and Note handsets.